Oh cruel irony… HP, which started their lives working out of a garage, has recently banned working from home. Then this email forwarded to me by a source today on an HP blog titled “Is work killing you?” In another ironic twist HP appears to have two rules. One for its own long-suffering employees and one for its customers. Well, workplace killer number one is stress. Something that all HP employees no doubt are feeling given their “all hands on deck” call. We know from studies that an inflexible work environment generates immense stress and while the rest of the world (apart from Yahoo) recognise this, HP seems to have missed that memo. The second killer in the workplace according to HP is; Sitting. All day, every day. Something that HP employees will be doing as they are forced, cattle like, back into their cubicles across the globe. Again, studies show that fractilised working has immense benefit, including better general health and increased productivity. Brilliant. You couldn’t have asked for a more Monty Python like blog, now could you. It seems at HP the best way to avoid the workplace killing you, is to leave, with online commentary showing a startling number of HP employees planning to do just that, with a huge negative backlash by their employees. Even more hilarious are the other companies, like Cisco, getting into those threads and telling HP staff to come on over, they have great flexible working conditions! Here’s a few samples from one online thread. Let’s face it, it’s a vastly distributed workforce, and going into an office won’t be beneficial to most. Rather than paying for facilities they would do better to pay for team members to have meetings once or twice a year face to face. In 8 years remote I only met one of my managers. Once. This policy has more downsides in terms of morale and attrition rate than upsides in terms of productivity and “synergies”. Interesting development at HP. According to Cisco’s Connected World Technology Report from 2011, 66% of college students and young professionals then reported placing higher value on workplace flexibility than salary. At Cisco, we think flexibility plays a big part in job satisfaction and productivity, and is symbolic of the new way of working. Additionally, exceptional collaboration tools are available to ensure employees stay fully connected, even when working remotely. HP’s bread and butter are technologies that are supposed to facilitate communication, collaboration, and knowledge sharing across physical barriers. This new requirement is an unimaginative effort to control … a sign of a dying corporation. If this was an assembly line … and people needed to stand in a row and put the next nut on the next bolt … this would make sense. But anyone who has adapted to chat, email, and virtual collaboration technologies will find this silly, oppressive, and limiting. 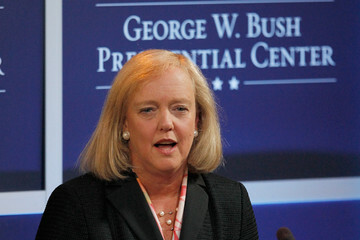 Another indication of HP’s downward spiral into irrelevance. Now, flexible working is not right for everyone, but it is right for the majority, and being trapped in a cubicle all day is certainly not helpful to the majority. It’s a dinosaur tactic stemming from the 1950’s poor work practices that were based on military rules. It’s the 21st Century for god’s sake and mobility is king. But what do you expect from a right wing CEO? Her political career shows the makeup of the creature when she was running for governor. She was dead keen to throw out the Global Warming Solutions Act (it saw a reduction in emissions), opposed water restrictions, and opposed Schwarzenegger’s climate change bill. Something at variance with this I would suggest. Her record is checkered, including the “housekeeper controversy” where Whitman and husband had employed an illegal immigrant by the name of Nicky Diaz Santillan. “The L.A. Times noted that Latino voters were more likely interested that Whitman treated Santillan “like a piece of garbage” when the maid asked for help finding an immigration attorney, and Whitman allegedly stated “you don’t know me and I don’t know you”. Source. Ah cruel irony. For a progressive company they sure seem to have a backwards looking CEO. Time will tell whether they can shake her loose and return to the halcyon years of the early 2000’s or if they will fade into irrelevance.